Jacques Kallis' participation in the remainder of the Cape Town Test is likely to be restricted to batting in the second innings, if absolutely necessary. 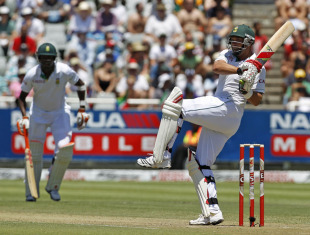 Kallis, who will "probably" miss the first two one-dayers following the Test series, was struck on the right side of his chest during his crucial 161, and batted with pain before he was the last man out. He did not take the field during India's innings, and will continue to sit out when India are at the crease in this match. "Kallis has been diagnosed with a contusion to the right rib area and accompanying muscle strain," Mohammed Moosajee, manager of the South Africa team and a doctor by practice, said. "The recovery time is two weeks, it can be slightly less or more than that. He will probably miss the first two one-dayers. He will definitely bat if he needs to in the second innings, but will not take the field." South Africa missed Kallis' seamers in the evening session, when Gautam Gambhir and Sachin Tendulkar resisted their attack with a dogged partnership that left the match evenly poised. Earlier, Kallis' heroics put South Africa on top, as he batted on with the tail, despite being severely hampered by the injury which often left him clutching his side in pain. "It was a little bit sore throughout the innings but you've just got to get on with the job," Kallis said after the day's play. "Most games you play, there is a little niggle and it was just another niggle. Hopefully it doesn't keep me out of the game for too long. While facing the ball, you forget the pain. Once you hit the ball your body reminds you that you are a bit sore." Since it is deemed an external injury, Kallis will be allowed to bat at his normal position, if he chooses to in the second innings. India currently trail South Africa with 220 runs, with eight first-innings wickets in hand, leaving the game in the balance going into the third day.